2 Bedroom Semi Detached House For Sale in Padstow for Guide Price £439,950. Bronnow was built in 2008, together with Trenoder, which is the matching mirror image. The property enjoys under floor heating throughout, two extra large bedrooms, bathroom and open plan kitchen/living room on the ground floor, with luxurious sitting room and superb sea views on the second floor. There is off road parking for two cars, a lovely mature rear garden, with raised deck and sea views from there and the kitchen. The property may suit those seeking a second home or holiday let, but it would also make a super main home. Double glazed bow window to the front with deep sill. Oak floor. Under floor heating. The suite comprises of a panelled bath, vanity basin, concealed cistern WC and glazed shower cubicle. Heated towel rail. Travertine tiling with under floor heating. Double glazed window. Double glazed window to the side. Oak floor with under floor heating. A stunning room with patio doors overlooking the rear deck and mature garden. A range of modern base and wall units with integrated appliances, including oven, hob, extractor, fridge and dishwasher. Under floor heating. Feature wall light. A stylish room with fitted cast iron wood burning stove. Patio doors and Juliette balcony with stunning views of Trevone and the headland towards Trevose. With low level WC and washbasin. From Padstow follow the B3274 Newquay coast road for around a mile. 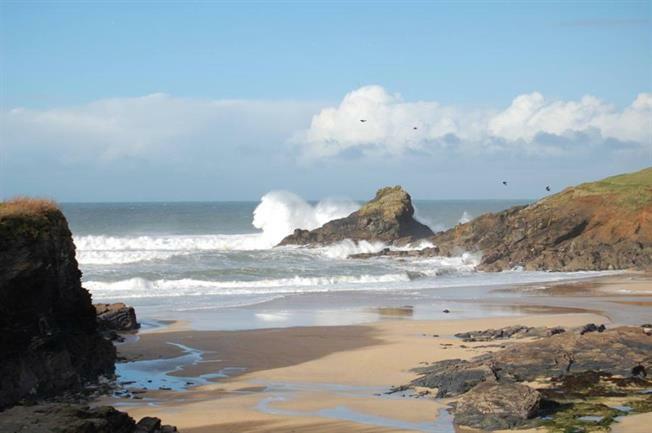 You will see the turning to Trevone on the right. Pass this and Bronnow will be found on the right hand side. An open plan pebbled parking area to the front. The rear garden is mature with lawn and flowing shrubs with a super sea view. There is a large raised deck that runs along the back of the property, and access via the side.